A Sweet Marriage Of Beauty And Functionality. For years, we’ve heard about smaller enclosures and saving space. Yet no matter how much we try to shrink the box, we have always been limited by the depth of the speaker. Shallow-mount speakers and subwoofers have existed for years, but the limitation for a long time has been that the smaller the mounting depth got the bigger the enclosure requirement. That kind of defeats the purpose, especially in trucks where space is slim. 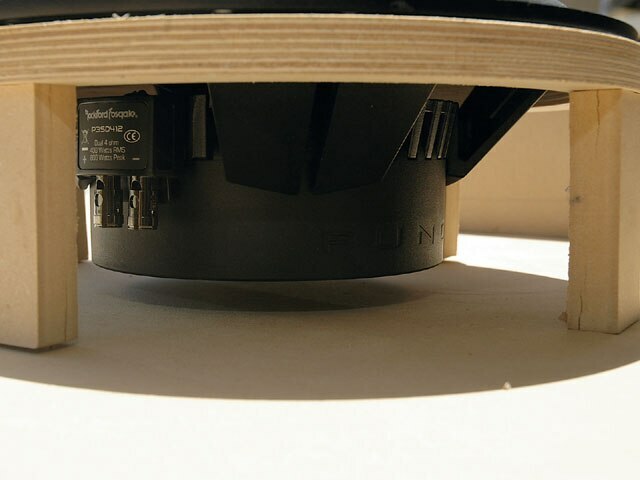 At the 2007 Consumer Electronics Show (CES), a new breed of shallow-mount subwoofer was introduced by various manufacturers-the long-requested small box shallow-mount sub. Flipping through the pages of LRM, we see many different trunks set up in many different styles. Each configuration has its own limitation. 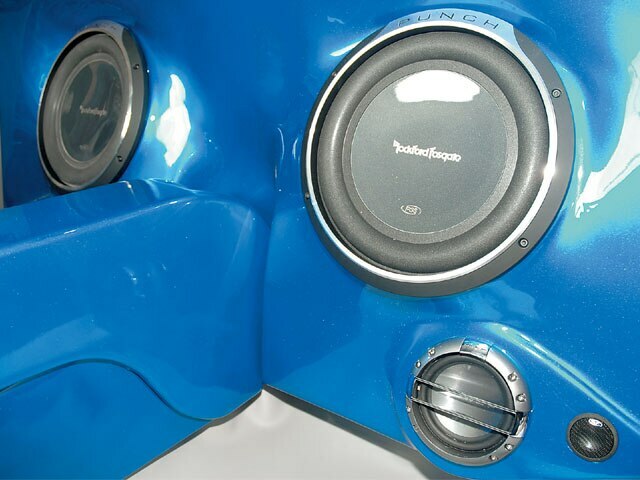 Most times, we can compensate for the magnet size and other times you see free air subwoofers; that is subs mounted on a board that use the entire trunk as an enclosure. While there is nothing wrong with a free air system, you need to know that the subwoofers you’re using are geared to work in this configuration, as many are not. The vehicles where this new breed of shallow-mount subwoofers would be the optimal solution are single cab trucks, convertibles and big hydraulic trunk installations. The coexistence of hydraulics and music has always been a problem, and this would be a good solution to an age-old problem. The days of having to redo your racks to add in a sound system could be a thing of the past. Our subject this month is a ’70 Chevy El Camino that has been outfitted with an airbag hookup. The first incarnation of this ride filled the spare well in the bed area and used four 8-inch subs to compensate for the shallow area. Our goal was to fill the interior of the cab with music and leave the well area available for the newly designed bag system. 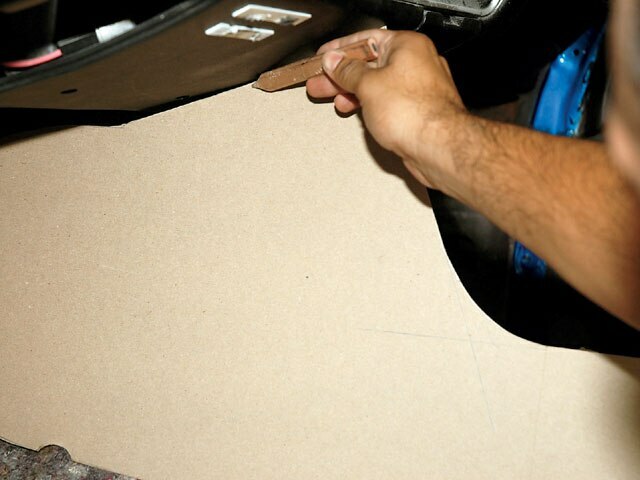 Follow along as we hook up the cab with some shallow-mounted beats. 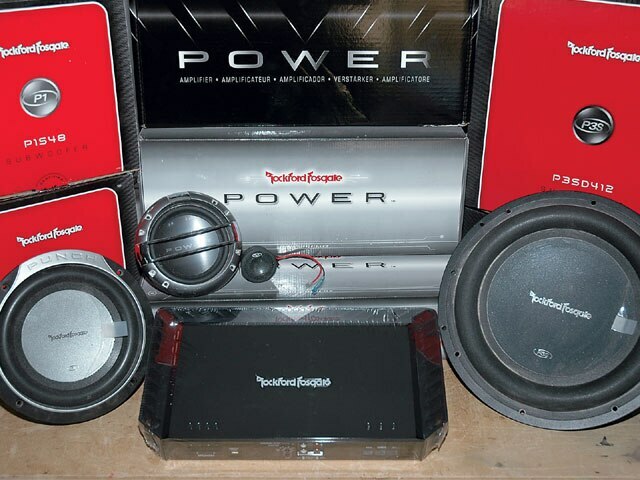 The system for this small cab consists of an array of speakers and amps from Rockford Fosgate. The newly designed shallow-mount 12-inch subs and smaller amps will fit the space requires perfectly. The area behind the seats is oddly shaped and extremely shallow. Without hugging the back of the seat, a standard set of subs wouldn’t fit well back here. 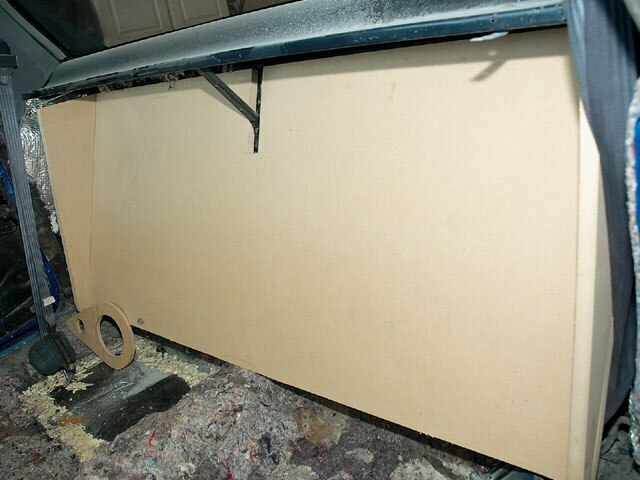 Before permanently securing the subwoofer frames, we need to confirm that there’s enough clearance behind the subwoofer. 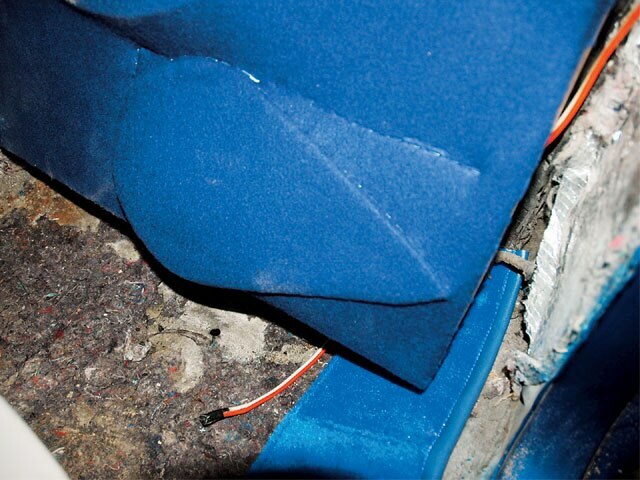 Every subwoofer needs at least a half-inch behind it or it will not function properly. 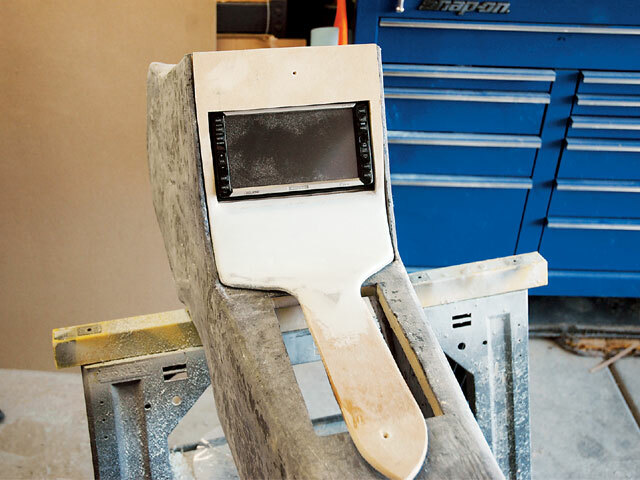 For a radio mount and interior accent, we opted to build a center console that would marry up to the enclosure. In order to fit it just right we used upholstery chip board as a guiding template. The first order of business is to flatten out the area and see what we have to work with. 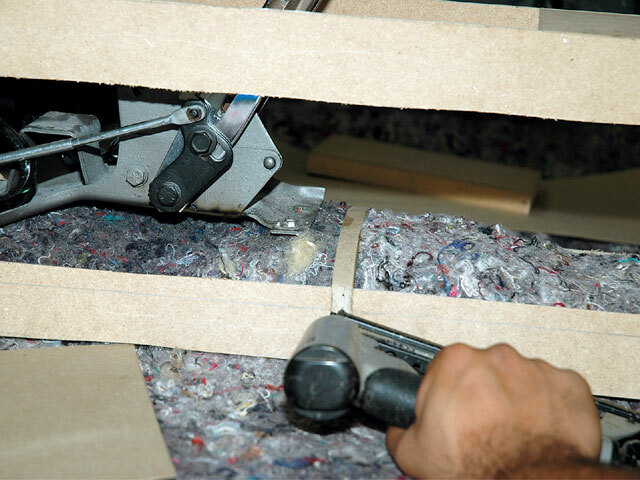 We begin by cutting a board to fit the area and the outer edges that will ultimately give us our flat-face panel. Next we measure up everything and finish constructing our frame work. The frame work is now in place. Notice the area in the center of the box. Because there’s a factory support in the center, an opening had to be created at the rear of the enclosure. Additionally, we decided to mount a second set of speakers in the rear for fill. The speakers were sectioned off so the subwoofers would not blow them out. Now we’re ready to stretch some cloth and resin it up. With this template, we can cut our first trial boards. Because of the cures and the angle that we hope to achieve, these may not be our final cuts of these boards. All painted up and dressed to kill. A sweet marriage of beauty and functionality. See you on the show scene. Slicing and dicing like info-mercial products, our first trial boards take shape. 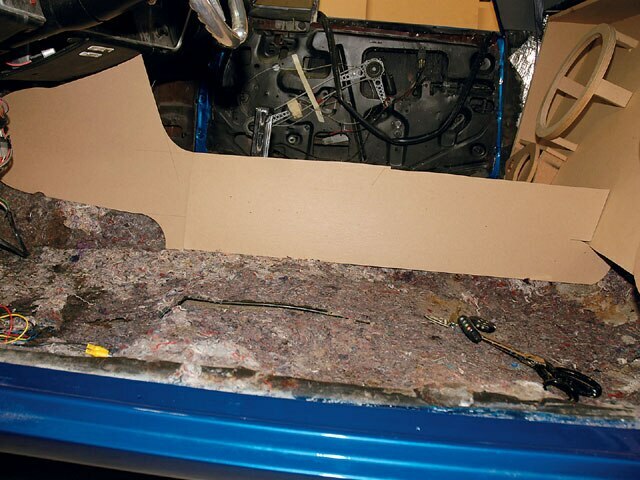 The radio mount and console top are secured to the side boards. Here we are tracing out the horseshoe shifter path so our console can go around it. In order to hold the desired shape, tack boards were secured in place with straps. 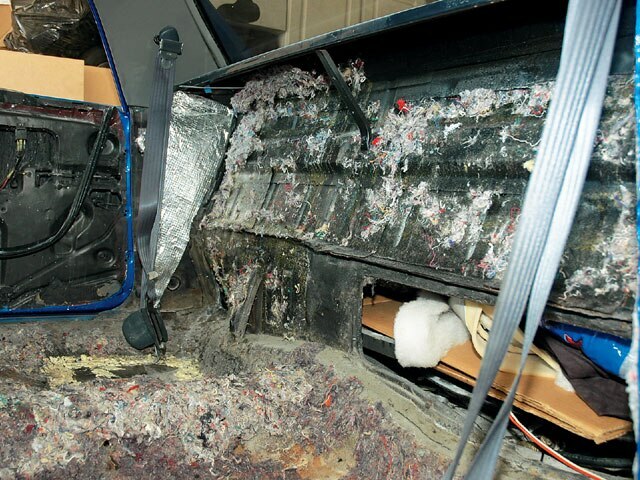 Upholsterers use these for vehicle headliner edges. 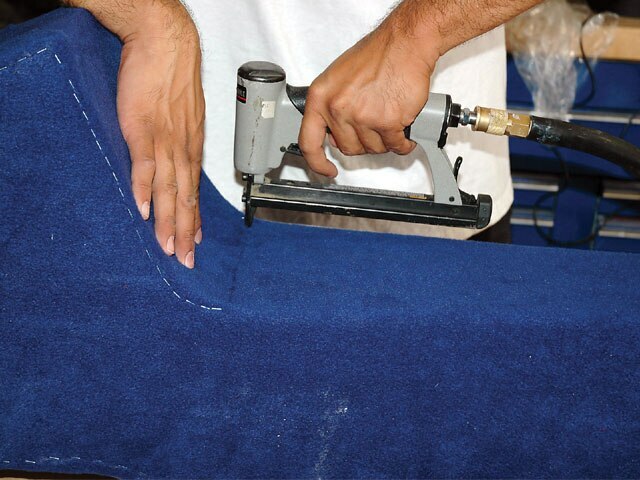 We can now stretch the polyester fleece on the center console. Here we are stapling the edges around the radio opening area. This area will be cut out and separated from the rest of the console later. Now that the box has been stretched and stapled, and the console has taken its initial shape, the missing link can be created. 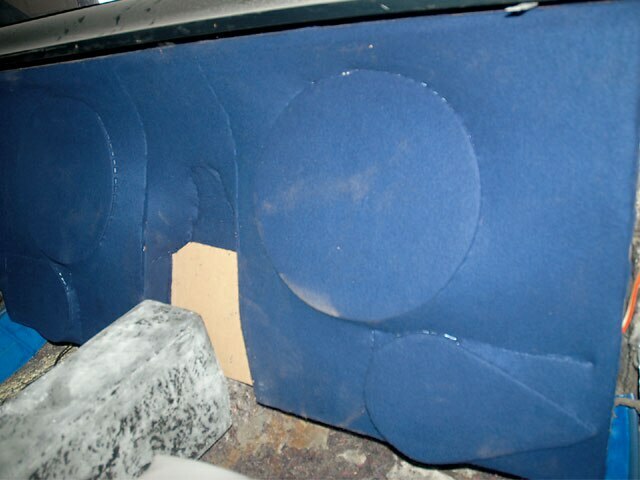 The radio trim panel was then constructed. First, a board was trimmed to fit around the radio and temporarily screwed in place. From there, a second board was made to first flush the angle of the radio trim board then to clear the shifter horseshoe. 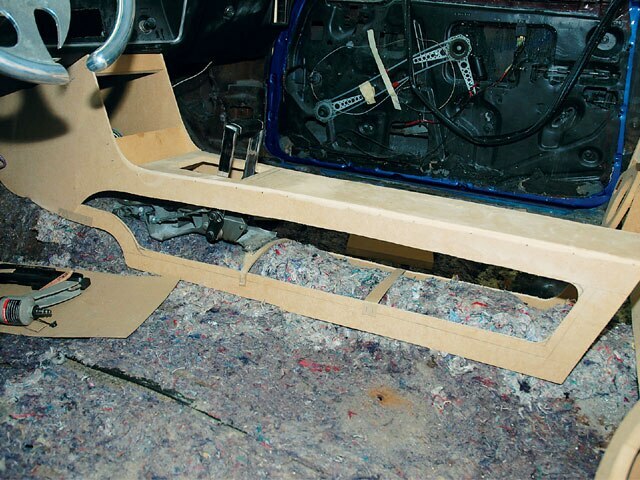 From there, they were joined and cloth was stretched to compensate for the rounded contour of the console. 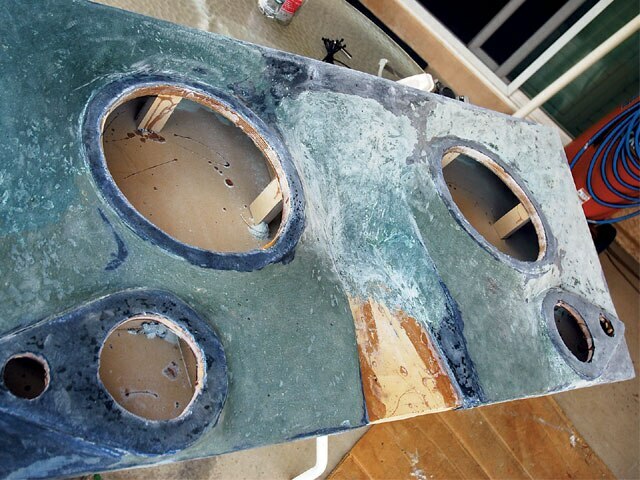 After resin and kitty hair were applied and hardened, the panel was body worked and smoothed before being sent to the body shop for paint. The console has now taken shape and is ready to wrap and resin. After our console has hardened and been shaped, we will add a guide to the box that will marry the box and the console as a single unit. The box was then treated in the same fashion. The stapling started across the top then down one side before proceeding to stretch the rest of the enclosure face. Notice the speaker face has been stapled all the way around. 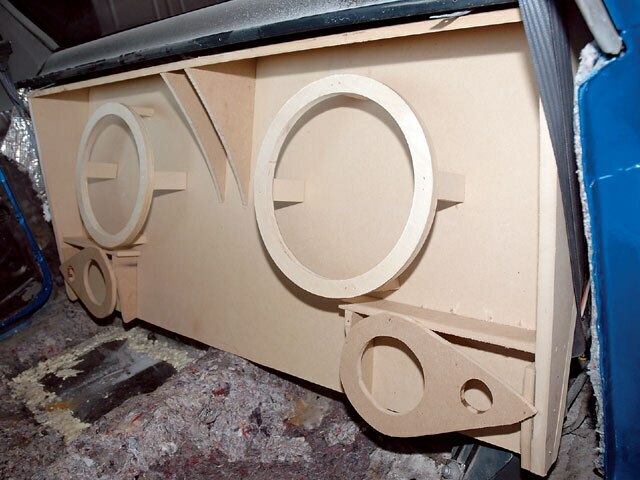 Once resin is applied, this will ensure that the speakers are separately chambered from the subwoofers. Resin is applied and kitty hair is shaped. The kitty hair not only helps shape the enclosure, but adds to the strength of the elongated sections of the box face. Now the enclosure is being sent to the body shop for paint.